Looks great! Love the texture and color of this one. Hi Libby - yes, I saw your announcement and I'm following you over there. Thanks so much. These are my favorite, so far. I'm just trying to figure out a favorite color combo. Thanks for taking an interest in SIBOL! I've just been taking another look at your work, and I completely agree with you, Crocheting or Knitting definitely relaxes you! Love these, Gene! They are SO pretty, and I agree that the texture would be great to help your grip! 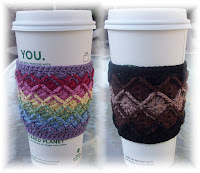 I've never done Bavarian crochet, but I'm always wanting to try something new! I'm headed to Rav now to get your pattern! Are these time consuming? I see you used # 3 thread. That's a step up from 10, right? Maybe like a cotton thread? Don't know if I have any! Will have to look! Thanks for your great patterns! #3 Crochet Thread is about twice as thick as #10 thread, so it's not as intimidating if you don't work with crochet thread much, and of course, you use a bit larger hook. 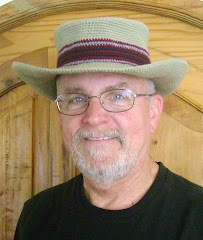 I've even made a hat from #3 crochet thread that will be highlighted in the upcoming April 2011 issue of Crochet World. I'm with you - I love learning new techniques.